I had no problem with 1803 or Avast IS, but thanks for information. 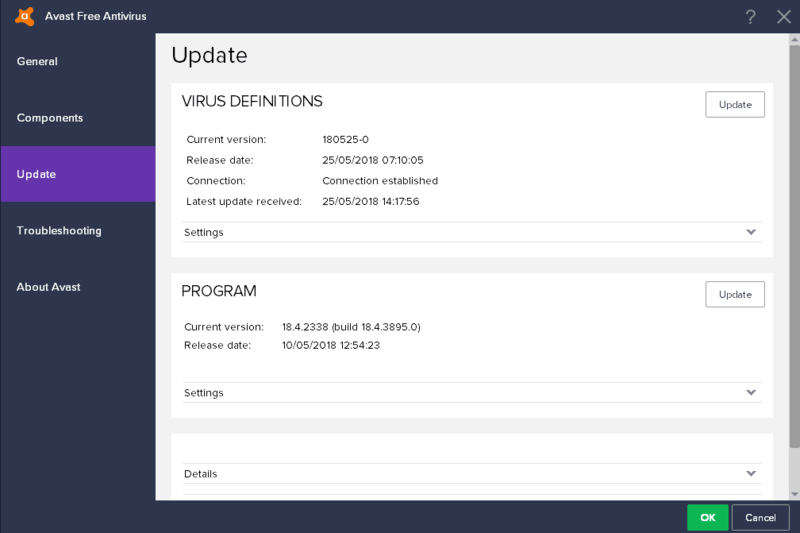 I updated Avast IS (paid) to 180525-02. The last time I checked, the AVG code was very similar to Avast code, so it may be good to ensure AVG is current if you use it. I’ve been using Avast since version 4.6 (when it looked fugly) and Windows Update problems were the last straw. KB4018372 and KB4022133 Office update installations kept failing, i’ve tried everything from reinstall, repair, etc. and it wouldn’t work until i disabled Avast. It also caused me problems last year with DISM and SFC because it locked system files and both failed when scanning for errors. Martin…..I do apologise that this is so ‘out of subject’ for this thread, but your new “cookie” box that you’ve likely just introduced because of GDPR…… will likely never go away, for those of us that don’t keep cookies, such as me. I think we are destined to forever see your message, because obviously, if we accept or your cookies are removed, the message will surely come up again and again? Sorry once again this does not belong here! Sophie this is all very much a work in progress, apologies for that, it is something that I don’t like at all but that is the solution right. I try my best to improve this. P.S. This stupid check box is double annoyance on this particular site. @Ban me – what you say is not really relevant to Martin’s “pop up overlay”. I use the extension you refer to, and that stops general EU type cookie warnings – and also I believe is under the control of the DEV for that extension, whereby sites have to be reported to him first, in order to be added to his ‘suppression’ list. I believe I’m right in saying that Prebake is no longer updated. At least, when I last looked, nothing was changing with it for some time. If its being maintained again now, great. Ahh, that’s why I never experienced this, because I never install Avast Behavior Shield since it caused trouble way too often, from CPU hog to memory hog. Avast should be always installed on “Minimal”, Web, Mail and File shields. All else is bloatware/system hog. It can’t be “on by default”, as that’ the whole purpose of the GDPR!!! Hi, I suffered the catastrophic problem caused by Avast Windows 10 1803 upgrade, with the blue screen of death etc. I had to get an IT technician in to attempt to fix it by reinstalling Windows 10, following the procedure recommended by Avast to protect existing programmes and data . This resulted in the loss of Microsoft Office 365 and absolutely all data, photos, music. The IT technician has tried to recover data from Windows.old but it is not there and right now it looks as though we have lost everything. I am likely to cancel my Avast subscription as I believe that Avast have acted very poorly in supporting paying customers. Are you sure that technician followed the LATEST procedure recommended by Avast for THIS specific issue? The ‘technician’ firstly, should have completely imaged your SSD or HDD before they did “anything”. Then, they should have followed those instructions to the letter. Instead, they/he/she appear to have just re-installed Windows. Getting data out of [windows.old] might likely have concerns, or issues. By imaging first, they would have helped to safeguard your position, and try a number of approaches, and ideally, they would have done all the work on a secondary cloned drive, leaving the main in tact, establishing what worked….and then applying it “for real”. “catastrophic problem caused by Avast Windows 10 1803 upgrade” ? It’s Windows, as far as I understand, that is principally responsible for these outcomes. If Avast does odd, undocumented low-level stuff…..sure, you could call that poor practices, but software development has always done that, and its only Microsoft’s moving the goal posts all the time just lately…that is exposing those particular weaknesses. Bottom line too, of course, is that Windows Update is utterly, totally, and almost irretrievably broken. The whole model of Windows [as a constant] Service is flawed, and they need to seriously reconsider their whole approach. Doesn’t mean that Avast was entirely responsible. It just means it was [Avast] that acted quickly, and found a remedy. The problem is still essentially of Microsoft’s own making. The flaw is the forced update, many computers were broken every big updates came. Microsoft doesn’t care about that because their real money is in the enterprise section. It’s fine to force security updates, but I don’t want features updates that I don’t even need. Why I can’t remove xbox thing in my work pc? I don’t need Mixed Reality! I want to work not play! If that technician screwed up, then it’s still helpful to know, as you don’t want to go back there again. But that still may be a useful repair service to recommend to your boss or mother-in-law, along with Avast. You will need a bit of patience. This is also happening on Windows 8.1. Avast and MS ruining it for everybody. A big thank you goes out to all the free beta testers who are experiencing all the issues like this. You early adopters make the phrase “Windows as a Service” have a whole new meaning. i was running AVG (free) when my Windows 10 (1803) update occurred and got the black screen issue. Trying to work through any resolutions actually caused a complete op sys failure. I had to use microsoft’s download to create a bootable USB recovery. While that got my system back (completely cleaned —luckily I save personal files to an external drive), it is without my original Microsoft Office package. 3 days of working on this to finally get up and running again. AVG protection? hmmmm. right. I too was running Avast free when my Windows 10 (1803) update occurred and I got the black screen issue. I was able to re-install Win 10 and my PC is now back to normal. But I am angry that this happened. Where is the quality control at MS ? Why can’t you opt not to install updates ? After all, my PC belongs to me, not to MS. It is criminal that MS allows these faulty “updates” to be released. What compensation will they pay? The real problem, however, is that the industry has allowed MS to become so dominant, and to not have any alternative to them, which MS exploit endlessly. Blaming MS for issues caused by Avast is like blaming your car manufacturer for breakdowns after you used non-OEM parts. Avast (and everyone else) had insider previews of 1803 at least 1 year before release, it’s their fault for not testing it enough. I don’t agree. MS are always moving the goal-posts with their rapid-releases, and sure….Avast take some share of the blame. But the main spotlight is definitely on MS, and not Avast. It would have been nice to have this information sent to subscribers of Avast. I just spent 180.00 to get my PC back up and running.